Hālāwai and New York Outrigger are pleased to present Nā Kānaka on the Hawaiian Airlines Stage and at the Family Tent at the Liberty Festival in Hudson River Park’s Pier 26 as part of the 2013 Hawaiian Airlines Liberty Challenge on Saturday, June 22.We call ourselves Nā Kānaka. There can be many translations (The Guys, The Humans, The Hawaiians) all of which are true. 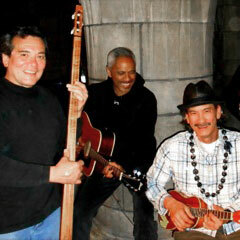 We are: Tommy Cheng-Oʻahu-Bass, Ed “Moke” Young-Oʻahu-ʻUkulele, Harry “Kalehua” Kepaʻa-Guitar, Stephen Day-Manhattan-Percussion. Our music can be called “Local Hawaiian Music from the back porches of our homes in Hawaiʻi to the island of Manahatta (the original name)”.